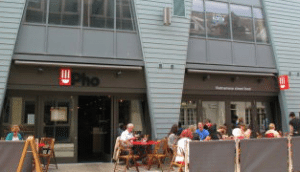 On a wet and miserable Tuesday evening my partner and I ventured out to Pho, which specialises in Vietnamese street food, in the Laines. At just a stones throw away from the beach, the chilly sea breeze forced us to scurry to the nearest available place to grab a bite. Unexpectedly we were greeted with a buzzing restaurant, but were able to be seated at the sharing floating island tables which run down the heart of the building. Although surrounded by other diners, the sharing seating wasn’t an issue at all and we didn’t feel overlooked or crowed in the slightest. We ordered cocktails to begin- their takes on a classic Mojito and Pina Colada- made with speciality rice spirit, which were very refreshing and delicious albeit taking quite a while to arrive. 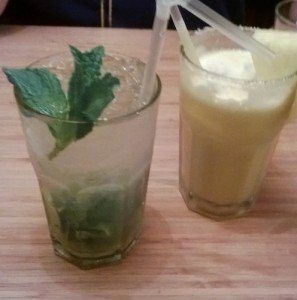 The waitress was very helpful with the menu, and also apologised for the wait on our drinks. She explained the different types of noodles, as there were several different varieties, and told us that we could change the types around if we preferred a certain type. 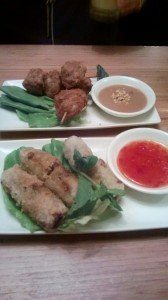 We ordered pork spring rolls and pork and lemongrass meatballs to begin with. The meatballs came with a creamy sweet and savoury peanut sauce which was a perfect accompaniment, although very tasty, the lemongrass was a little bit lost among the other powerful flavours of the sauce. here was a slightly long wait for main courses, but the restaurant had stayed consistently busy and it wasn’t an unreasonable wait. The ambience also stayed lively, as more and more people came in and for such a large venue the place feels incredibly intimate. Different wood textures adorn the walls, and the low lighting and soft red furniture accents all combine to create a contemporary urban oriental feel. Main courses were slightly hit and miss. My Bun Cha Gio Bo Xao Sa was exceptional, and I was presented with a large bowl overflowing with vermicelli noodles, tender beef strips, coriander and salad. While my girlfriend’s Com Tam Rang, or aromatic chicken and dried shrimp and wok fried broken rice, was somewhat tepid and nowhere near as full of flavour as the rest of the meal. Both portions were presented in a refreshingly unpretentious way, and the generous portion sizes left us satisfied even with some leftover. We needed a bit of a breather after our mountain of food, so decided to try out some Tao Meo; one Rose Apple flavour and a passionfruit flavoured one too. Having no idea what this was, we were excited to be presented with a small tumbler of a amber liquid which smelt strongly of fruits and alcohol, and at 27% a glass, they were definitely potent! We then decided to order one dessert between us, even though we were already full the chocolate truffle ‘slab’ with green tea ice-cream seemed too tempting to resist. The chocolate ‘slab’ was exceptional; rich, thick and creamy. The ‘slab’ itself was a bit like a parfait, sitting on a sliver of dark chocolate sponge. 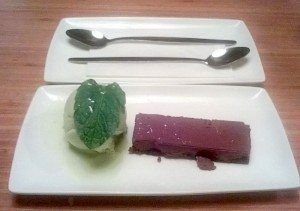 The dessert was a tiny bit let down by the green tea ice-cream accompaniment, which had only the slightest hint of green tea- but the chocolate component was so exceptional it didn’t hinder our enjoyment of the dish as a whole. Overall, Pho’s cool vibe and (mostly) delectable menu was a hit while service was knowledgeable and friendly but not overbearing. 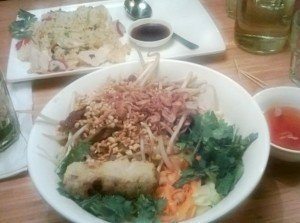 As novices about Vietnamese food, we weren’t sure what to expect, but the selective menu is focused and provides all the information we needed, and will certainly be back to experience more of Pho’s delights.